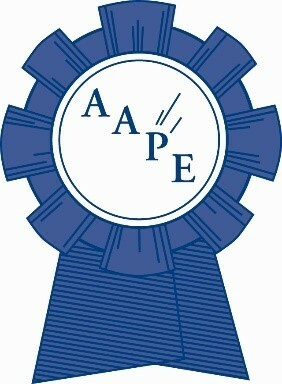 The Hennig Award Committee of the AAPE consisting of John M. Hotchner and Ronald Lesher, and chaired by Eliot A. Landau, is pleased to present the 2009 Bernard J. Hennig award for excellence and improvements in philatelic judging to Charles J. Peterson of Maryland. Charlie Peterson, like Bud Hennig and John Hotchner before him, is one of those intense, hardworking but soft spoken leaders in national and international philately whose intense efforts led to many reforms and innovations in philatelic judging. The quality of his work not only stands out by itself but leads so many others by example and by mentoring numerous other judges from the novice level into the ranks of the highly accomplished. Charles J. Peterson, born December 7, 1933, is a resident of Laurel, Maryland with his beloved wife Lanny. He was educated in English, Public Administration and History and served as Administrative Specialist for the Department of the Army having won the Exceptional Civilian Service Award, the highest available. Peterson was first accredited as a national APS judge in November 1969 first as a literature judge and later literature chief judge, philatelic judge and chief judge. He has also been accredited as international (FIP) chief judge in literature and in philatelic judging. He served as jury president at special literature exhibitions and for all of Washington 2006. Among his many national and international achievements and recognitions have been two John N. Luff Awards, election to the Roll of Distinguished Philatelists (RDP) 1991, and the Alfred F. Lichtenstein Memorial Award of the Collectors Club of New York 2008. He served as a member of many APS committees including Translation (1975 through the present), International (1999-2008) and CANEJ (2001-2005). He has been a trustee of the American Philatelic Research Library since 1996, Treasurer (1996-2001), President (2001-2005) and its Secretary since 2007. In addition to his service as a director of the American Philatelic Society, he has served as a member of the Board of Vice-Presidents. He has been the vice-president of the Association Internationale des Journalistes Philat�lique (AIJP) 1991-2003 and President of the Philatelic Literature Commission of the FIP 1973-2000 and Director (2000-2008). In 1973 at the Munich FIP Congress, Peterson was appointed to create a functional Literature Commission and develop regulations and procedures for literature judging and have them all in place for the major exhibition in Stockholm in 1974. The regulations were presented to that Congress in 1974 on an interim basis and received full approval at the Madrid Congress in 1975. Peterson also wrote all the subsequent modifications of the FIP regulations for exhibiting and judging philatelic literature up through 2008. These served as the models for the national level literature judging rules. Charlie wrote the US literature regulations for the APS Judging Manual first through fourth editions (1981-1999) and just submitted the draft to CANEJ for the sixth edition scheduled this year. He was a major contributor to the first FIP regulations for exhibiting and judging postal history (1975-1976) and was in the first group of judges to be FIP accredited for judging postal history, along with Ernst Cohn. Peterson was one of the three FIP committee members responsible for drafting the regulations for One Frame exhibits which became fully effective as a class (no longer experimental) in 2008. During the trial period, he was frequently the team leader. Charlie judged in over 60 FIP internationals with class assignments including Traditional, Postal History, Literature, One Frame, and others and served as team leader on most of them. He also has judged at 25 US and Canadian national shows both philatelic and in literature, including PhilLitEx, New York City, 1992, where there were 550 entries in competition, the largest philatelic exhibition of literature ever, and he prepared written critique sheets for each entry. After serving on ten regional/multi-national exhibitions, he then became a member of the expert committee at the FIAP-sponsored Taiwan Exhibition where he introduced the use of a scanner to copy and enlarge for field examination of suspected items and retention of hard copy prints as well as digital images. This was all later written up and illustrated by him for FIP's FFE Journal. Peterson has conducted more than 25 lectures and seminars at national and international levels for current and potential judges and exhibitors. He has been repeatedly involved in seminars and individual mentoring and, by personal example, taught generations of judges how "to do your homework." Of course this led to frequently providing detailed critiques and even critique services for exhibitors both at the frames and by mail. He also provided editing services for numerous monographs, handbooks, catalogs and lengthy articles both in paper and electronic formats. In 1992, he took the first step in incorporating electronic literature into the established literature class. His efforts were successful in having electronic literature recognized as a regular subclass of philatelic literature starting with Israel '98 and obtained partial funding for a two-day judging seminar in Malmo, Sweden followed by a public symposium to teach the area and better introduce it to judges who had not yet experienced that innovation. We are all deeply indebted to him for creating so many fields of modern philatelic and literature judging. We are proud to honor him today.